A welcoming committee is present in the hall of Yiga Tcheudzine temple during monthly sessions to introduce newcomers to the centre. Its role is to help participants by telling them about the different activities, giving them a tour of the premises, answering their questions, etc. According to the Buddhist tradition, it is important for the institutes to offer access to their activities free of charge. The activities are open to everyone. Therefore they depend on the attendees' generosity for their survival and operation. Donations and proceeds from membership fees help cover the organisational and maintenance costs. Donation boxes are available in the hall of Yiga Cheudzin temple. One may bring offerings such as food and flowers to ceremonies and teachings. The institutes are intended for study, retreat and contemplation. To favour concentration it is therefore preferable that one maintain a courteous, respectful attitude in all situations. Out of respect for Buddhist precepts, you are asked to respect the written word by abstaining from putting books on the floor, walking over them etc. Intoxicants such as tobacco and alcohol are not to be consumed on the premises. The buildings are open only during the activities listed in the calendar. It is possible to become a member of the association law INSTITUT GUEPELE 1901, which is in charge of the organization of teaching, curriculum and retreats (in coordination with the Ganden Ling congregation and the Buddhist Institute of Lamrim Cultural Association). Becoming a member allows you to take part in the vote during general meetings of the association and is necessary to participate in the retreats. Application forms Memberships are available at the reception during activities. Yiga Cheudzine temple is designed to allow you access and participation in our activities. 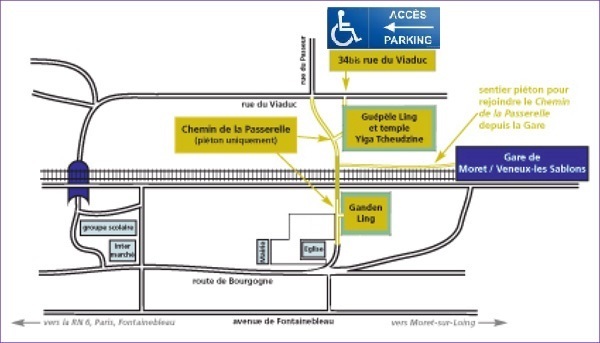 Access by car is via 34bis rue du Viaduc, Veneux-Les Sablons (black metal gate, yellow wall, access panel PMR and parking inside) and not by 'Chemin de la Passerelle (ATTENTION GPS may misdirect you if you do not indicate the street address: rue du Viaduc). Please contact us by email before your arrival so that we can welcome you in the best conditions (guepele@gandenling.org). If you are worried about entering an activity listed in the program (opening of the gate, ....), Do not hesitate to use the intercom next to the gate or to call 331 607 039 81. Moret-sur-Loing / Veneux-Les Sablons Train Station (SNCF), approximately 45 minutes from the Gare de Lyon. Exit via the footpath from platform 1, track 1L, take the footbridge over the train tracks. The institutes are located on either side of the tracks. Take Autoroute A6 towards Lyon and get off at the Fontainebleau exit. At the Obélisque roundabout at Fontainebleau take RN6 towards Montereau-Sens and then the Veneux-les-Sablons/Moret-sur-Loing exit. The institutes are located on either side of the railway tracks.